TOKYO - Beady Eye back on tour at the same time of Premier League new season's kick off. Exactly 20 years ago, 18 August 1991, Oasis were playing their first gig ever, in Manchester @ Boardwalk (they played other times there), supporting the band Sweet Jesus. 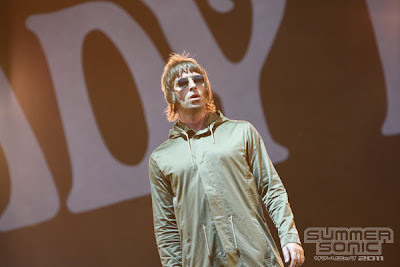 And they're still there on the stage, tonight Beady Eye played in Austria. So we can say that Oasis' birthday is on 18 August. Zodiac: (English St.Mark-Man City) Leo :). But in 1991 they were unknown, Alan dicovered them almost 2 years later, 31 May 1993 in Glasgow, Scotland, supporting the band 18 Wheeler. On 18 August 1994 they famously played @ Camden studios for the Mtv Most Wanted (acoustic Live Forever and Whatever). This photo and video is from the first mini-tour in Japan the other day in Tokyo and Osaka (they'll come back in September). Big news: Liam had a (little) haircut. More about these gigs soon. Another birthday. Tracks from the likes of Oasis, The Beatles and Radiohead will be re-worked into orchestral arrangements by the Royal Philharmonic Orchestra and the Crouch End Festival Chorus at a weekend-long concert to celebrate the 80th anniversary of Abbey Road studios. To be held over two days at West London’s Chiswick House and Gardens, The Symphony In The Park’s first night, on August 20th, will host the symphonic versions of a selection of rock and pop classics, while the second night, August 21st, will see various film scores recorded at Abbey Road being performed live in all their epic glory. Speaking of Abbey Road’s 80th year, one of the studio’s most famous exponents, Sir Paul McCartney, has spoken of his Abbey Road memories and the Symphony At The Park concerts. You can download the one in 1997 with Oasis songs here. Weekly competition reminder, to elect the last 25 years best artist for Q Magazine anniversary, you can vote again and again: click here and go down on "who's the greatest" and "create your 25", put them in order (you can add 3 more, as The Verve, Stereophonics, Suede, etc.). Vote Oasis as 1st, of course, and spread the word to Oasis fans, don't let Muse, Coldplay and Green Day win, they already have too many votes they don't deserve. You can win a BlackBerry every week.